We’re mashing up 2 cultures on 1 stage with an open dance floor! Starting with dance lessons, each band plays a set, then the two meet and jam. 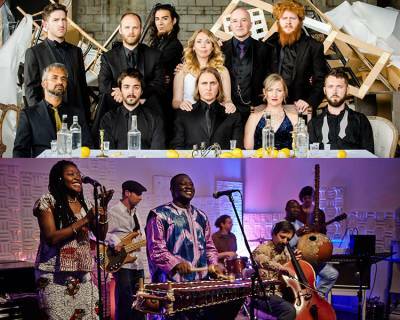 Lemon Bucket Orkestra, Toronto's multiaward winning, world-touring, groundbreaking guerrilla-folk party-punk Balkan-brass band, meets NYC’s Kakande, with lush vocals, sinewy koras, flutes, cellos and the balafon (xylophone) of a master griot from Guinea. Come ready to dance!